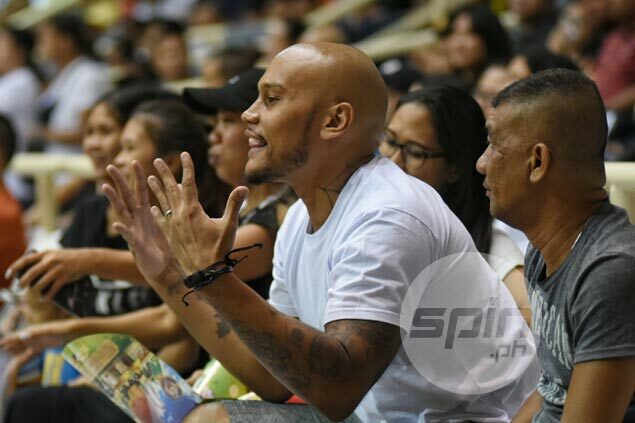 Kelly Nabong watching Alab Pilipinas' game against Singapore Slingers on Wednesday night to cheer for good friend AJ Mandani. KELLY NABONG just found a new home in the PBA. Globalport took a chance on the volatile power forward after including him in its official 15-man roster for the coming 43rd season of the league. Team owner and congressman Mikee Romero confirmed the signing of Nabong, who was put on the unrestricted free agent list by Meralco following an incident with the team during its semifinal series against Star in the season-ending Governors Cup. The 6-foot-6 Fil-Am from Sacramento, California, was signed to a two-year deal. Nabong, according to Romero, adds muscle and ceiling to GlobalPort's frontcourt manned by youngsters Bradwyn Guinto, Arnold Van Opstal, rookies Lervin Flores and Joseph Gabayni, together with the comebacking Yousef Taha. This will be the second stop of the 29-year-old Nabong at Globalport, where he played for two seasons from 2013-15 before lading a spot at Meralco. For a while, Nabong appeared to have finally settled down at Meralco, where he had been a part of coach Norman Black's rotation and a key player when the Bolts reached the finals for the first time during the 2016 Governors Cup. But in an unexpected twist, he got himself involved in a shouting match with deputy coach Jimmy Alapag in the stretch run of Game One between the Bolts and Hotshots during the semifinals last season. Team insiders later said Nabong never made an effort to mend fences with the Bolts following the incident, prompting management to release him. Even without him, the Bolts went on and earned another finals trip in the season-ending meet, where they lost to the Barangay Ginebra Kings in the decisive Game Seven. Along with Nabong, also signed by the Batang Pier was lanky rookie Andreas Cahilig, who was given a one-year contract.